Marx foods always has some fun new contest for adventurous foodies. This was no exception. I was sent an assortment of products and had to make something with chocolate incorporating at least one of them. Opening the package was like Christmas: two types of peppers, a vanilla bean, coconut sugar, fennel pollen and candy cap mushrooms. They were good… the fennel pollen and salt work together to give you a great surprising hit of flavor with the chocolate… turns out fennel pollen and chocolate do go well together… Please vote for me over at Marx Food. 1. In a sauce pan, heat the sugar over medium until it begins to caramelize stirring occasionally. 2. When the sugar becomes caramel colored and is all dissolved, slowly pour in the cream. Be careful because it will boil and sometimes splatter. Continue stirring until it has been fully incorporated. If the caramel seizes up a little, continue to stir over the heat until it is liquid again. 3. Remove from heat and stir in the butter, salt and fennel pollen. 1. Heat the heavy cream in a sauce pan until it begins to bubble. 2. Pour over the chocolate and stir until melted. 3. Mix in the olive oil. 4. Stir in the salted caramel. 5. Set in the fridge for at least an hour to become solid. 6. 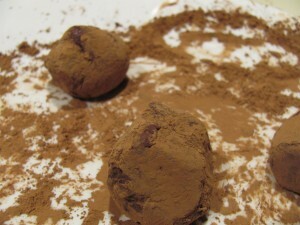 With a spoon or melonballer, spoon out about a tablespoon of the ganche and roll it into a ball. Roll in the chocolate cocoa powder. P.S. Marx Foods supplied the fennel pollen and other contest ingredients mentioned in this post. Starting a new job is always awkward… you are introduced to everyone in a blur, shown around the office and then left alone to start working… But overtime, you start to get to know your co-workers and the awkwardness fades… especially, when you discover a shared love for Food 52. My current co-worker, Megan (or meganvt01) is the creator of Roasted Sunchokes of Hazelnut Gremolata. I was excited for this random connection. I had already bookmarked the recipe to make later. Now, besides talking about law, we can discuss food! Another Food 52 recipe that I love is Grown-up Birthday Cake. I wanted to make something for my mom’s birthday that was different and new. She makes so many cakes that this one needed to be special. The cake was delicious. I made the cake as written except I used vegetable oil and not olive oil. 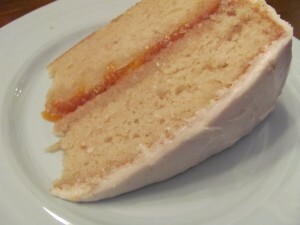 I iced it with a vanilla buttercream and filled with a homemade peach-vanilla jam. The wine gave the cake layers a really subtle fruity flavor without overpowering. It was really special! A perk of food blogging… free cookbooks! 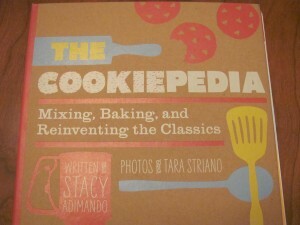 The latest cookbook to land on my door-step was the Cookiepedia. This is a super cute cookbook for a beginning baker. It gives a nice overview on most of the classic cookies and a few I had never heard of (salt & pepper cookies?). She also adds some variations so a beginning baker can start to experiment with different combinations and flavors. I started with Brownies because I love brownies and I can easily compare them to others. The recipe was well written and easy to follow except the baking temperature is not easily discernible. You see the cute little oven cartoon in the top right-hand corner? That is where you find the temperature. As for taste, the brownie was alright. I wanted something that had more chocolate but these ended up being more like a chocolate cake. 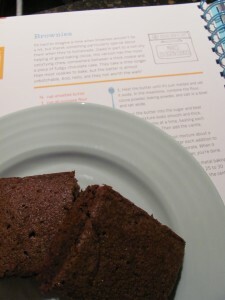 The recipe’s introduction talked about the difference between fugdy and cakey brownies. I think it would have been beneficial to have a variation for both. Next up, Pecan Sandies. The picture looked great… pecan shortbread with roasted pecans on top… but that is not what I got. My cookies spread all over the place. I had put them in the fridge to set up before baking. It did not seem to work. I think the butter may have been way too soft to achieve shortbread cookies (Caveat: I did halve the recipe). I was dissappointed with these. 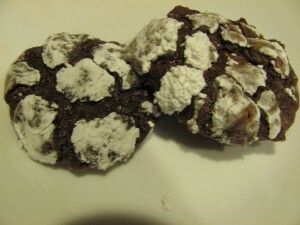 Finally, I made Chocolate Crinkle cookies. Yummy! Fudgy Goodness! I love these cookies. My only issue with the recipe was that it took longer than expected to bake. Overall, cute cookbook but best for a beginner baker. Disclaimer: The Cookipedia was sent to me to review by the publisher.